Try Growing Your Very Own Blueberry Plants! I have been an avid gardener and have wanted to try growing my own blueberry plants.Over the past few months I have done a lot of research on growing blueberries. I have learned that growing blueberry plants is not as difficult as I had previously thought. Even if you live in area where the soil is not perfect for growing blueberries, you might still be able to grow a dwarf variety in a pot on your patio. 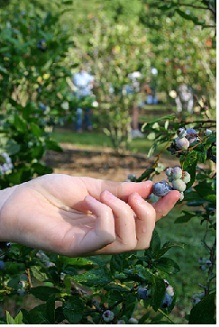 Blueberry plants grow to an average height of 4-6 feet tall. They are shrub like and can be used in your lawn as an ornamental bush. You can also buy dwarf varieties that grow just 2 feet tall. Perfect for growing in containers or next to a patio. Plants require full sun with moist acidic soil. Blueberries need to be grown in soil with a pH of 4.8. A pH of 5.0 is too high. Berry suppliers recommend you have your soil tested and amended prior to planting. To do this, you could contact your local Cooperative Extension office for information on how to test your soil. I have, in the past, sent in a sample of my soil to be tested by our state ag office. The analysis gave me more information than I needed. For this project I'm just going purchase an inexpensive pH kit from our local hardware store and then I will adjust the soil accordingly. Space Blueberry plants 4-5 feet apart. Plant at least 2 different varieties for the best yield of fruit. Put plants in 1' X 1' holes and cover the roots up to the natural soil line on the plant. Mulch heavily with bark or straw to keep the roots moist. Be sure to remove all the flowers during the first year. Do not allow the berries to develop because they will restrict the shoot growth. You want all of the plants energy to go to the roots and branches. You will not need to prune branches for the first several years. Harvest will begin in the 2nd or 3rd year and continue for at least a decade. An added bonus - the shrub like plants leaves turn brilliant red in the fall. Wow, ornamental and tasty!